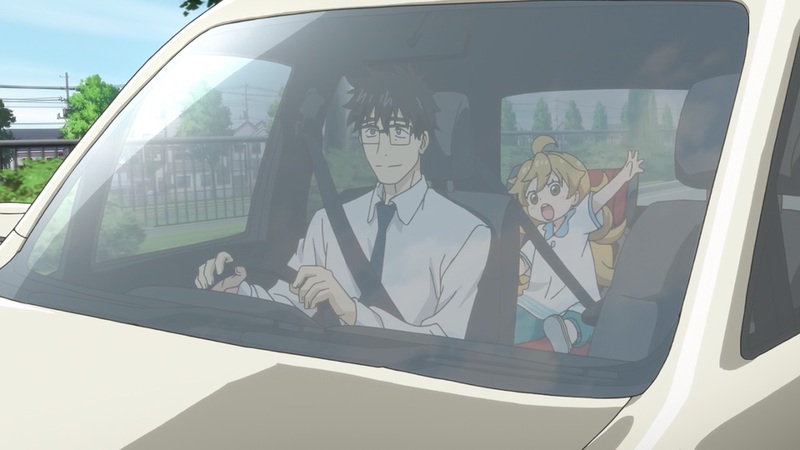 I hesitate to call it a surprise since I was warmly anticipating it, but so far Sweetness and Lightning has been the new summer series I have enjoyed the most. 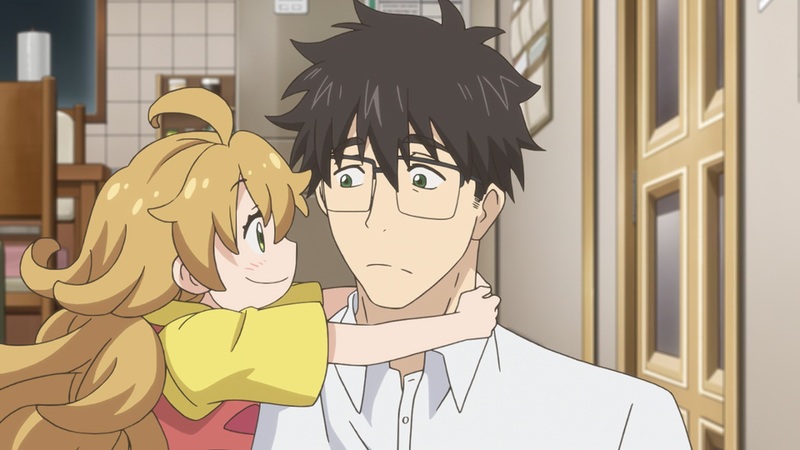 An immediately charming series focusing on a parent-child relationship that feels very sincere, it could hardly go wrong. There’s something that wasn’t a given and played a big yet understated role in making that premiere so compelling though: Tsumugi’s strong visual characterization. Her believable acting as a child sold the first episode even to viewers who weren’t conscious of it. How did they achieve that? Her movements are energetic but erratic, a bit clumsy too, and often you can find her in the background visibly enjoying herself. 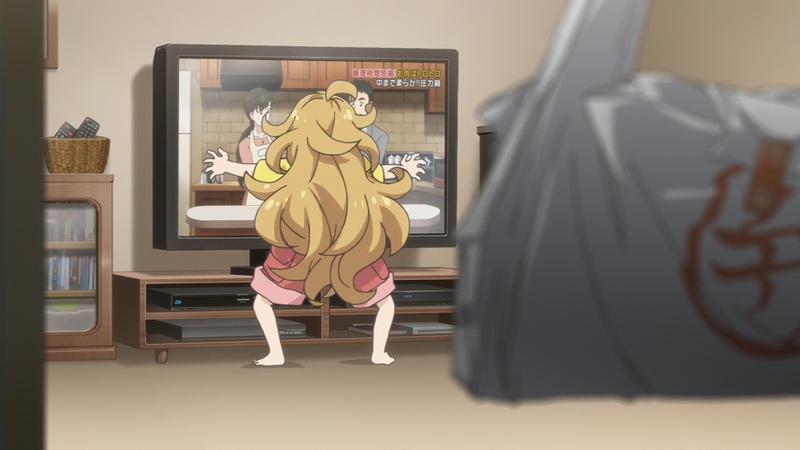 In the clip above you can even see her attention span is limited – she wants to watch her favorite series, but once her dad offers her food she carelessly drops the case. She physically expresses affection all the time, and even interacts with objects in a similar way. The manga already offered a solid basis by placing her in situations a curious child would get into, but this adaptation takes it a step further as you can see in this fully original little scene; she’s tired, but forgets about it for a moment to proudly tell her dad that she knows about something. The draftsmanship itself isn’t particularly impressive, taken in a vacuum perhaps only the first cooking scene – which mostly features her dad instead – would be an actual highlight. The timing and delicate movement there might catch even the untrained eye. I’m inclined to agree with the guesses that Keisuke Kobayashi worked on this scene, it’s fairly reminiscent of his output on Working. Humans don’t move with the blind conviction of a robot, and limbs don’t simply freeze after an action, that’s something his animation tends to stand out for. Leaving that entire segment aside though, the rest of the episode isn’t filled with memorable cuts. This isn’t to say that the execution drags the episode down, if anything it speaks volumes of how well conceived the scenes are that just functional motion gets the point across. Nuance doesn’t always require excellence in all fields – a decent board can be elevated by exceptional character animation, just like how excellent blueprints can carry ordinary motion. You can’t entirely neglect either, but otherwise a strong balanced can be achieved. Quite a few more series have started already too, more than we could possibly cover. The focus of this site will mostly be interesting work we want other people to appreciate, but I feel obligated to point out that Rewrite’s double premiere was a poorly constructed mess, the miserable proof that scene flow is very medium-dependent. Similarly to how you can notice the seams on uninspired 4koma adaptations, you could see – and hear, since the sound direction came down to “abruptly switch to every character’s theme song” – every screen transition from the original game. Anime needs a more organic progression, that episode’s structure alone was a deal breaker. It did have some neat Masayuki Nonaka cuts as anticipated though, which I’ll eventually want to talk about. Orange also performed as expected, which in its case is a positive; strong direction on the moody side, and Hamasaki’s usual hazy scenery couple with beautiful background art. My one worry was whether he would be able to convey that the core of the series is a group of friends that really enjoys being around each other, and moments like the whimsical bonding montage are convincing me that he will. There’s already been some neat little surprises as well, like the very impressive Puzzle and Dragons Cross intro. The scene’s scope is impressive, those aren’t the kind of layouts you’ll often see outside of high profile films. Keisuke Watabe’s preferences are crystal clear, there’s a lot of focus on smoke and debris, and even the dragon’s shading resembles FX drawings during the darker scenes. 2D creatures and background animation are something to be treasured in TV anime, especially when they’re this good. Onslaught of new cartoons aside, this past week we also had a few Mahou Tsukai Precure moments worth mentioning. A bit of a surprise, since the latest episode was almost fully animated by Mitsuru Aoyama; as someone who has been solo key animating episodes for over 30 years he’s a genuinely important part of anime’s history, but his incredible drawing speed is sadly not accompanied by similarly strong polish. Which is a polite way to say that his episodes have been known for a while for looking rather rough and lacking in animation. 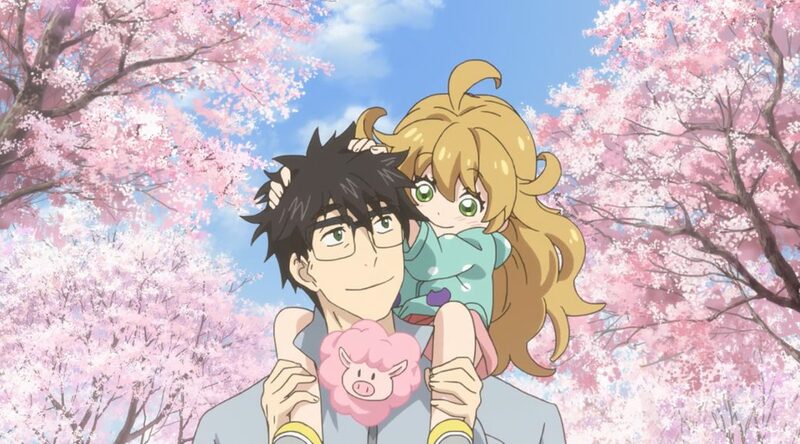 Thankfully, this time it was an important episode so he was helped by Nishiki Itaoka, who is currently trying to carry Precure’s animation all by himself – and not even for the first time. His scene in this episode was particularly interesting, since there was a noticeable influence by Shingo Fujii’s work from the previous iteration of the series. Stylistic choices like the petals and action quirks like the camera rotation look straight out of Fujii’s work in GoPri. It’s not even the first time something like this has happened, even Kazuhiro Ota started to use similar layouts as Fujii. A young digital animator having a tangible influence on the work of his seniors is quite cool! The henshin itself is worth celebrating too, as a rare case of actually thematic transformation sequence – once again an instance of mundane draftmanship being made all that much better by strong ideas. Usually you’ll see magical girls interact with the element their powers are themed around, like fire, water or electricity, but just on a surface level. This one though follows a plant’s growth until its flowers bloom, appropriate both for the nature of her powers and how the character started the series as a baby and has now matured. I don’t think all sequences need to be this well thought out, a flashy henshin with no narrative grounding will always be impressive, but it’s hard not to appreciate this. Yuta Tanaka is one of Toei’s best directors, so I’m glad he got over his post-GoPri melancholy to storyboard this. Here’s hoping he keeps doing good work, be it in Precure or somewhere else. 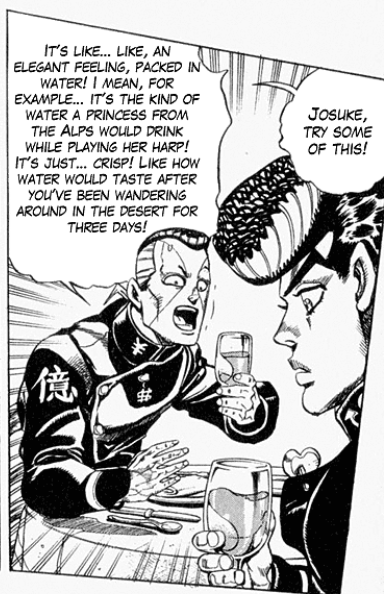 I can’t stop myself from at least briefly mentioning Jojo, which once again had a really strong episode. It seems like even the staff loves Rohan, since his introduction episode had a ridiculous lineup with the series director Naohatsu Tsuda, assisted by their best people like Toshiyuki Kato and Yasufumi Soejima. Their main priority was nailing Rohan’s intimidating presence, but they also had fun presenting him as an artist. This season has regularly been taking mundane moments from the manga and reframing them more creatively, making even the downtime interesting to look at. At some point I’d love to write something longer about the series, particularly about Kato’s layered constructions, but for now I’ll be content to say that Jojo is stronger than ever. And that’s about it for now, that’s the gist of what I intend to do with this regular series. Currently airing anime offers a useful framework, with lots of content and material people will be likely to care about, but it won’t necessarily be limited to that. I’d rather bring up interesting work, so whenever current anime runs low on that I can easily fall back into older anime. Either way, look forward to more! How come there is no mention ob Taboo Tatoo ep. 1’s insance fight? Any clues as to who may be the animator? I mean, WE NEED TO FIND OUT! I might get to talk about the show at some point, both for the good and for the bad – dynamism at the cost of spatial understanding isn’t the best. Nothing about the fight itself has been properly sourced as far as I know, the one thing that immediately stood out to me was Hironori Tanaka’s work in the OP. Depending on how labor intensive it is, I’d be interested to see someone go into good vs. bad draftmanship. Or are draftmanship interpretations squarely subjective? I’ve only recently been able to catch off-character miscues and other production hiccups without having stare at single frames. Even so, I’m not confident I can see what constitutes poor draftsmanship as described in the post. I /might/ be able to see some inconsistencies in the henshin example, but my ability to discern such things is better served as refuse for a trash can. Keep up the good work, hope the blog stays around awhile! Art can be appreciated at a personal level, who knew? Between your reply (thank you much) and tamerlane’s liberating post today, it’s relieving that the personal “eye-test” is worthwhile. That said, I definitely appreciate this blog’s intricate looks at individual scenes and the individuals behind them.